Taxus baccata, more commonly known as the English yew or common yew, is a widely cultivated hedging conifer, and has been for many centuries. While native evergreen hedging conifers are a relative rarity in Europe and the UK, the lovely taxus baccata is a remarkable exception to this rule. With its deep green needles and striking, bright red fruits in winter, the common yew makes an outstanding evergreen hedging plant. Garden enthusiasts worldwide have recognized the excellent hedging qualities of this yew species, which is quite likely the most popular hedging conifer in Europe and the UK and it is easy to understand why, as its dense, compact growth habit and strong tolerance of pruning makes the common yew an ideal hedging plant. Like many other conifers, taxus baccata has an exceptionally long lifespan. If maintained properly, the common yew can reach an age of up to 600 years. Specimens have been found in the UK that were estimated to be over 1,000 years old, though it is worth noting that the exact age of yew species is almost impossible to determine. It is a proven fact that they outlast humans by several centuries however, and therefore, a yew hedge will decorate your garden for a lifetime. Subsequently, yews are universally accepted as a symbol of everlasting life. Being a native species, native birds tend to have an eye out for the tasty berries. Humans can technically eat the fruits, but we would strongly discourage you from doing so, as the seeds are poisonous. Taxus baccata is the tree originally referred to as yew, but as more species from the taxus genus were discovered, the need for a clearer common name arose, which is how it came to be known as the common yew or the English yew. The species has been present in the UK since the last glacial period, which is quite uncommon for an evergreen hedging plant, as most evergreen species did not reappear until the climate in our part of the world warmed up again. This proves how tough the taxus baccata is, as it was able to survive the ice age and is still around today. Back in those days, there were not many plants that remained green even during the harshest winters. Yet, the common yew did and as a result, it can be seen as the original evergreen hedging plant, and it is still in demand to this day. It is easy to understand why, as the common yew is a strong, tough and relatively undemanding plant, which is not susceptible to any diseases. Taxus baccata has been admired as a symbol of everlasting life for a long time, but it has also been feared as an omen of doom. 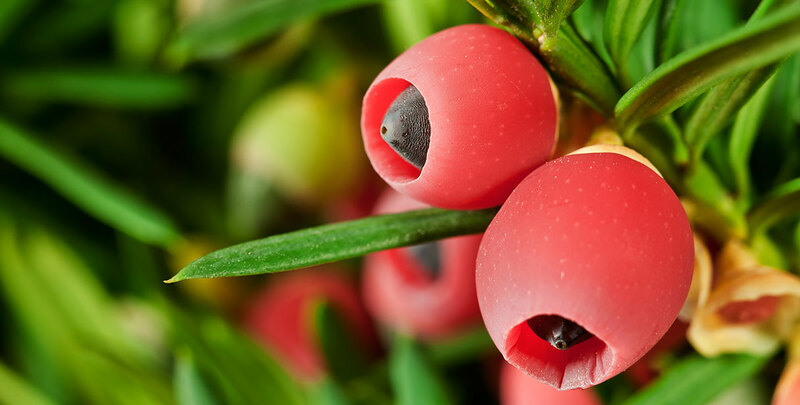 This is likely due to its high toxicity, as all parts of the plant except for the actual fruits are poisonous, but all other parts of the common yew are considered toxic enough to kill humans and livestock alike. Taxus baccata has an exceptional hardiness and a great tolerance of shade. However, it does not require shade to thrive – a position in the full sun will be tolerated equally well. Chalky soils are no match for this sturdy evergreen, which makes it a great choice for difficult alkaline soil types disliked by most other conifers. 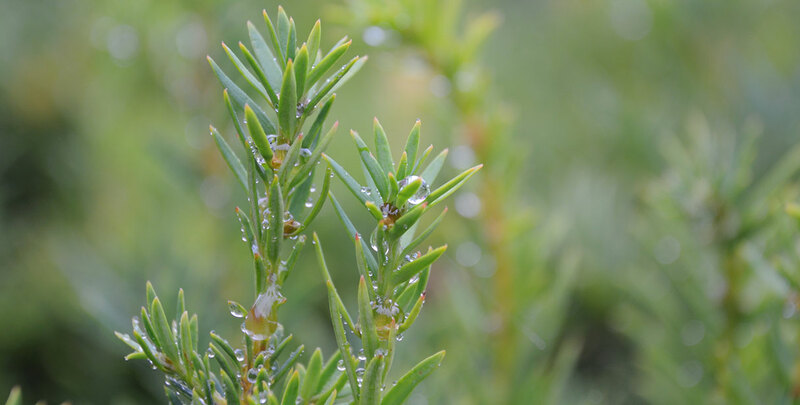 Be careful with heavy soils though, as these tend to be prone to waterlogging and common yew hedges must not be allowed to sit in water for too long, even though it does favour soils which are relatively moist. As is common with other conifers, a common yew hedge needs to be watered in case of prolonged drought. This is especially true for newly planted taxus baccata hedges, which require regular watering. Common yew hedges allow for rigorous cutbacks and will always recover, even if you cut back all the way to old wood. This feature makes taxus baccata an easier plant to maintain than other popular hedging conifers, such as the Lawson cypress and the Leyland cypress. Taxus baccata hedges are undemanding to the degree that it can even be used as a topiary specimen, which is more difficult with other conifers. This is not only caused by its tolerance of pruning, but can also be attributed to its slow growth rate. Slow growing plants are typically better suited to topiary than fast growing plants. A common yew hedge should be pruned at least once a year, preferably during springtime or in the autumn. Taxus baccata has been a popular hedging plant for centuries and it still is to this day due to its hardy, strong nature, its tolerance of pruning and its versatility. The common yew is simply a classic. A taxus baccata hedge will decorate your garden for a lifetime will retain its healthy green look for all those years. 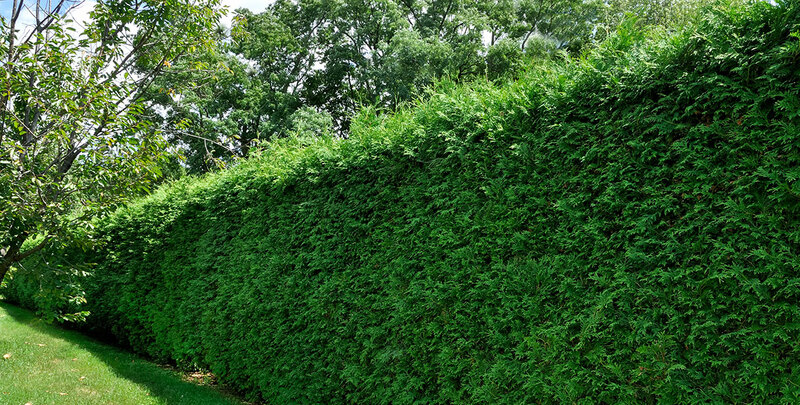 In addition, it makes an excellent privacy hedge due to its dense, compact growth habit and its ability to reach a height of up to 20 metres. Of course, we recommend you trim your hedge back to an acceptable height long before that happens. 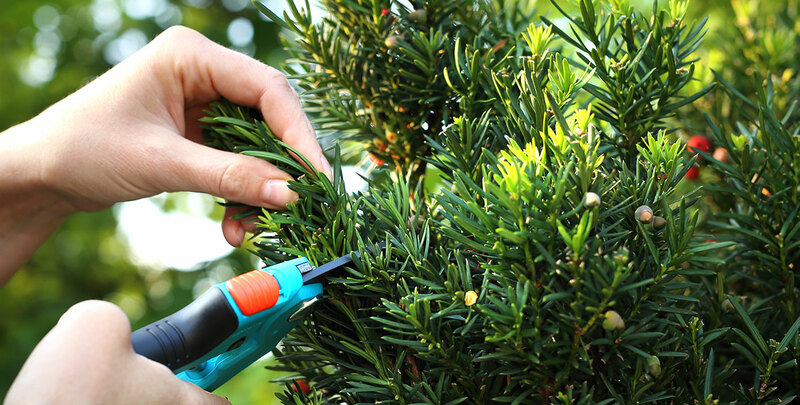 Luckily, it is fairly easy to prune a common yew hedge, which is why maintaining this type of hedge is simply a breeze. All these qualities make the common yew an exceptional hedging plant.